Rubber horseshoe is easy and safe to throw! The 6.5"H x 5.5"W shoe itself is firm yet not brittle, it's flexible enough where you could pull it apart and not have any evidence of tearing in the center and has realistic horseshoe markings. Shoe weighs 8 ounces. 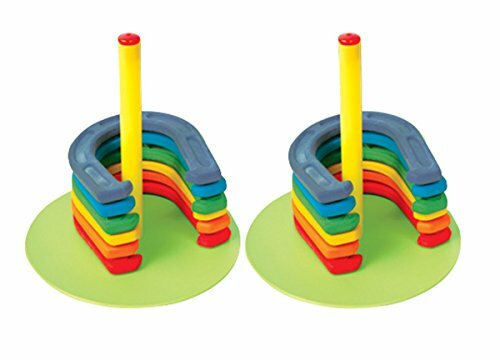 Rubber horseshoes are easy and safe to throw! Colors make it more fun and can be used for different variations in the game! Shoes weigh 8 oz. each and have a nice firm feel. Perfect for introducing the game to kids!